After you make the initial introduction of your brand to your target Millennial audience, you can begin to develop the brand relationship. In this stage of the experience, you can use some sales-oriented content to encourage users to take the next step. At the relationship-building stage, it’s important not to solely focus on selling to your Millennial prospects. One of the qualities that Millennials seek is value in the content brands share. They’re looking for content that gives them a reason to engage. This content can be in the form of a conversation. Ask questions or conduct pools, surveys, or ongoing industry discussions. When something relevant to your industry is being discussed, it’s appropriate for your brand to participate in the conversation. For example, suppose that you sell a particular tech gadget, and Apple announces a shift in the way some aspect of their devices work. This announcement gives you an opportunity to share your opinion either on your owned channels or on a public forum where a conversation is already taking place. By sharing tips and insights that demonstrate your expertise in the industry, you’re providing value. You’re also highlighting why you’re the best of all the options on the market. You want to ease the potentially awkward scenario of overtly selling a product or service on a medium like a social network, which is intended to be conversational. One strategy you can apply in the hopes of avoiding that awkward situation is to offer users a special discount or a deal to first-time customers. Special deals create an incentive for the customer to convert and help you decrease the conversion time. When you find that third parties, like influential bloggers, discuss your product, you want to make sure that your audience sees it. This content will further cement your status as an industry leader and keep your brand top of mind when your prospect is ready to make a purchase. After a user becomes a customer, the brand content should shift from pursuit to relationship growth. This stage is where ongoing, personalized communication becomes your most valuable asset for long-run expansion and survival in the market. To get the most from the touchpoints in this stage of the consumer cycle, you should consider using one-on-one communication, either in real-time in a messaging application or via email. You also should consider incorporating the following elements into these communications. Personalization: It may seem like a small detail, but personalization goes a long way with Millennials. When you can add their name to correspondence — for example, in an email subject or body text — you increase the likelihood that they’ll engage with the content. Appreciation: Little things go a long way. That is particularly true when it comes to showing your appreciation for your customers and your audience. Sharing content that communicates your gratitude helps solidify the relationship you’re building with Millennials. It also enhances the brand experience after a conversion and increases the chances of repeat business. 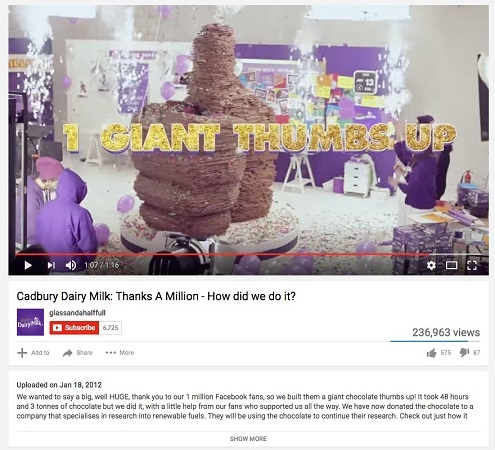 An example is when Cadbury, a UK-based candy maker, shared a video thanking its fans on Facebook after it hit one million fans. Cadbury built a giant chocolate thumbs-up to show its thanks for one million fans. Community: Making your content more about the community, the industry, and, most importantly, the audience after they’ve converted goes a long way toward solidifying the relationship. It also enhances the brand experience and adds value to your content. Regular communications: It’s hard to build a relationship with a brand that has gone dark after a conversion. Keep up regular contact with your audience, both new and old.